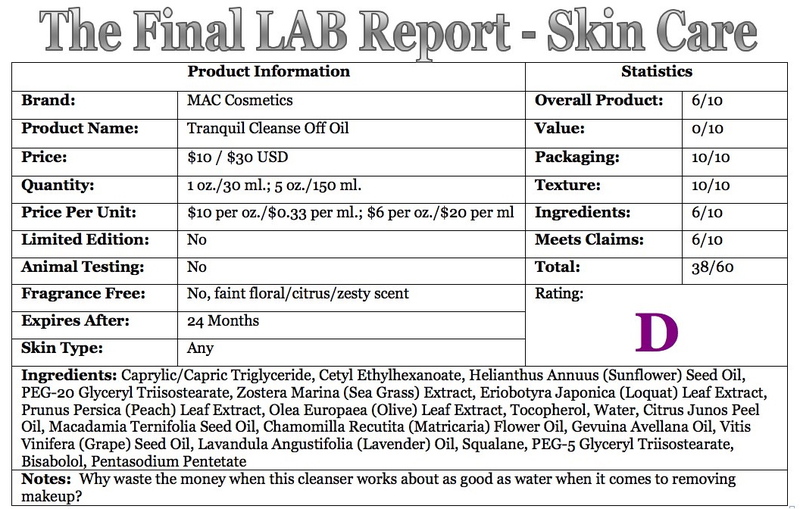 Not too long ago, I was at my local MAC picking up some essentials and as I was paying, I noticed the skincare display and remembered reading the great reviews for MAC’s Cleanse Off Oil. I started to ask the makeup artist what the difference is between the original formula and the MAC Tranquil Cleanse Off Oil ($30 USD for 5 oz./150 ml. ; $10 USD for 1 oz./30 ml.) and he told me the Tranquil Cleanse Off Oil is supposed to be gentler on the eyes and skin. Well, needless to say I got suckered into buying the travel size (1 oz./30 ml.). Total impulse! 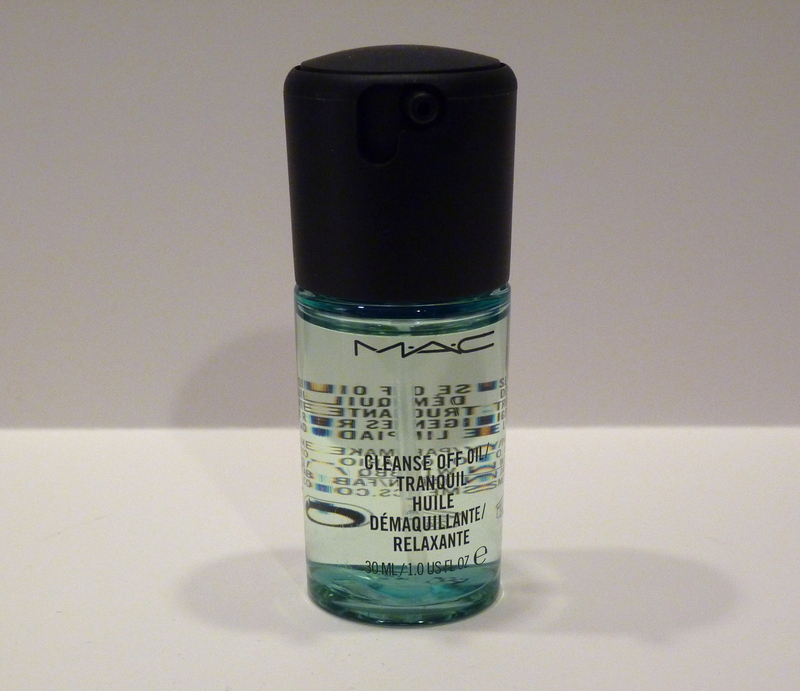 On MAC’s website, this cleanser is described as a “mineral oil-free makeup remover/cleanser for the skin. Formulated with extracts of sea grass, peach leaf, soothing chamomile-derived bisabolol and scented with citrus-y yuzu, fused with conditioning botanical oils of grape seed, olive leaf, sunflower and lavender. Apply, splash with water. Lifts off makeup leaving skin clear, soft, relaxed. Ultra-gentle: especially good for dry, mature or stressed-out skins.” Now that’s one hell of a description, but there are two red flags: 1.) citrus-y yuzu and 2.) lavender-both of which you do not want in any skincare product. The fragrance in this product is a very faint floral/citrusy/zesty scent. Red flags aside, this simply is not really an effective cleanser. I tested this three different times, hoping maybe I was doing something wrong. First, I squirted this on a cotton round, held it over my eye for 30 seconds to let it sink in, and wiped away. To my dismay, hardly any makeup had been removed, and it did not want to breakdown my non-waterproof mascara! I ended up switching to my usual makeup remover because i did not want to keep rubbing my eye. I did two additional tests in which I swatched regular and long-wearing/waterproof products on my hand and tried to use this cleanser to remove them. In all fairness, is great at removing makeup that can easily be washed away with water (what’s the point of wasting money on this when you can use water?!? ), but you’re outta luck if you want it to remove anything long-wearing or waterproof-it’s TOO gentle. The cleanser itself washed away easily and I did not experience any oily residue. In the end, this experience reinforced that I need to stick to my guns of not purchasing any skin care product without researching it first! Had I known there is citrus and lavender oils in this, I would not have even bothered buying it.